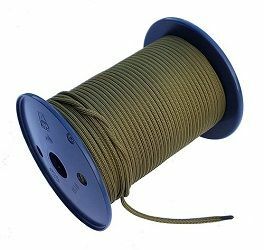 3.5mm Nylon Khaki Green Para Cord made from braided polyamide 24 strands with a parallel core. Strength 3kN (approx. 300kg), manufactured in Europe to EN ISO 1968 & EN ISO 9554. Melting Point 225°C, Temperature of Softening 170°C, Max Working Temperature 100°C.